Locked in a sweet, loving gaze, this couple celebrates heartfelt emotion—knowing each holds the key to the other's heart! 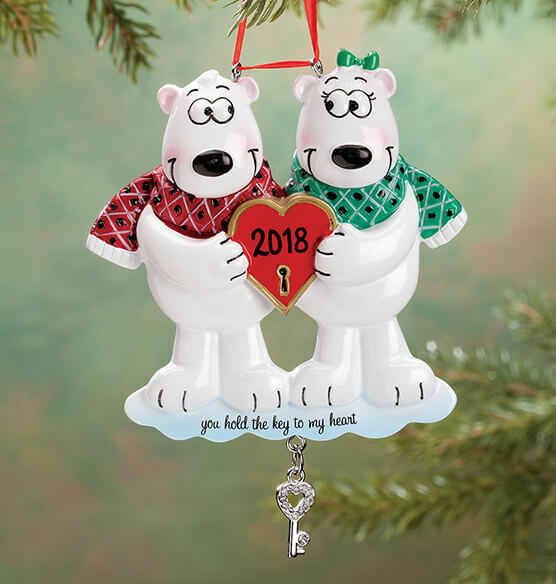 Adorably detailed in shiny, painted resin with a dangling metal key, our Personalized "Key to My Heart" Ornament features the words "you hold the key to my heart". We'll add any year to the red heart, creating a custom gift to honor a wedding, anniversary, engagement, first kiss ... or another year of bliss! Specify year; limit 4 characters. Christmas ornament measures 3 3/4" wide x 5" high.